Easy spool loading makes supply replacement quick and easy. 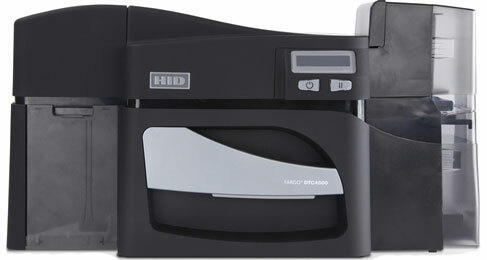 The Fargo DTC4500 provides professional quality, full color ID cards and security encoding all in one pass. Operation and supply replacement are both intuitive, making extensive training unnecessary. With an unheard of combination of footprint flexibility, field upgradeability, ease of use, and ease of integration with other HID products, you'll receive maximum value for your asset protection budget from the most trusted name in secure identity solutions. In one pass the DTC4500 can print, encode, fluorescent print, and laminate security cards - single- or double-sided - with a very fast print speed. Its superior performance makes it ideal for users who need the high volume print runs where quality and security are most important.Enjoy superior performance - In one pass the DTC4500 can print, encode, fluorescent print, and laminate security cards--single- or double-sided--with a very fast print speed using just one USB or Ethernet connection. The standard 200 card input hopper adds additional capacity and makes it ideal for users who need the high volume print runs where quality and security are most important. The Fargo 49304 is also known as Fargo Electronics	FGO-49304	.